Lung cancer is the leading cause of cancer-related mortality in the world, with more than 1 million deaths/year. Over the past years, lung cancer treatment has been based on cytotoxic agents and an improvement in the outcome and quality of life for patients has been observed. However, it has become clear that additional therapeutic strategies are urgently required to provide an improved survival benefit for patients. A major intracellular signaling pathway, the Hippo signaling pathways have been extensively studied in neoplasia, including lung cancer. Furthermore, the study of constitutively activated receptor and their downstream signaling mediators has become a promising new field of investigation for lung cancer treatment. Nevertheless for lung cancer, this approach has not been successful yet. Here, we will review the molecular basis of Hippo signaling in lung cancer and further discuss the therapeutic potential of multi-targeted strategies involving Yes-associated protein inhibitors. Purpose: The purpose of this retrospective study was to investigate whether Stage IIIC (TanyN3M0) breast cancer can be classified further into subgroups with different prognosis. Materials and Methods: One hundred and thirty-two patients with Stage IIIC breast cancer at Tianjin Medical University Cancer Institute and Hospital were analyzed. The disease-free survival (DFS) and overall survival (OS) were calculated by Kaplan–Meier method for lymph node ratio (LNR) and the number of positive lymph node (PLN). The receiver operating characteristic curve analysis was performed to determine the optimal cut-off value of the LNR and PLN. The univariate and multivariate analysis were applied to identify the prognostic factors. Results: The results showed that the optimal cut-off value of LNR value was 0.65, and the optimal cut-off value of PLN was 15. The Kaplan–Meier survival analysis showed the higher value of LNR or PLN was correlated with shortened DFS (P = 0.002, P = 0.008, respectively) and OS (P < 0.001, P = 0.001, respectively). In multivariate survival analysis, the value of LNR and PLN were still remained as independent prognostic factors for DFS (P = 0.014, P = 0.013, respectively) and OS (P = 0.004, P = 0.002, respectively). Conclusion: These results suggest that the value of LNR or PLN could be used as a new significant prognostic biomarker for Stage IIIC breast cancer patients. 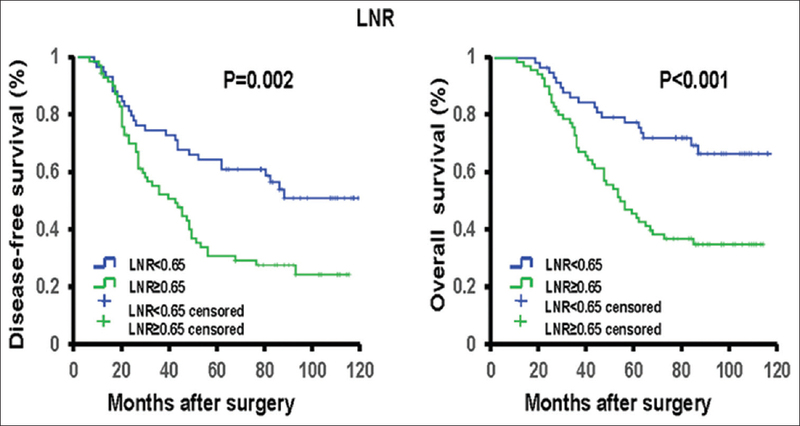 Stage IIIC breast cancer patients with lower value of LNR or PLN may be down staged. Background: The extent of the benefit of erlotinib in the treatment of advanced nonsmall-cell lung cancer (NSCLC) is still controversial when compared with docetaxel. This meta-analysis was performed to compare the efficacy of erlotinib with docetaxel for different patients with advanced NSCLC. 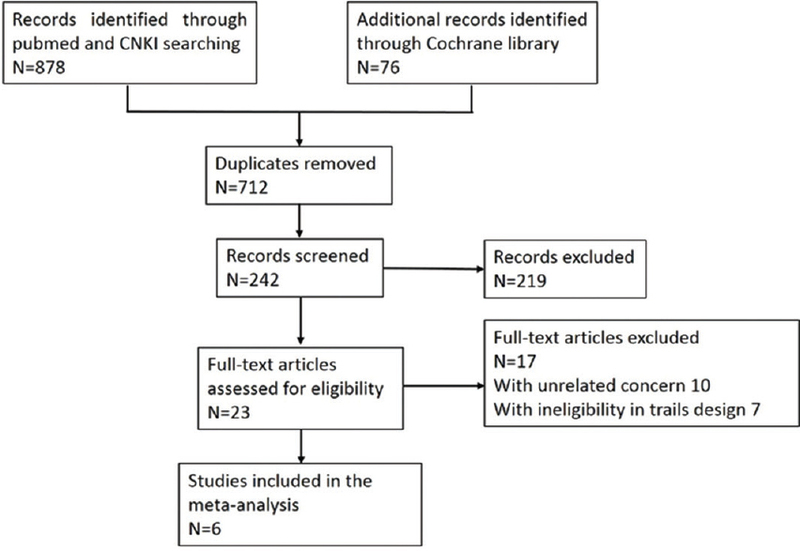 Materials and Methods: We searched Cochrane Library, PubMed, CNKI, and identified 23 randomized controlled clinical trials from 2008 to 2015. 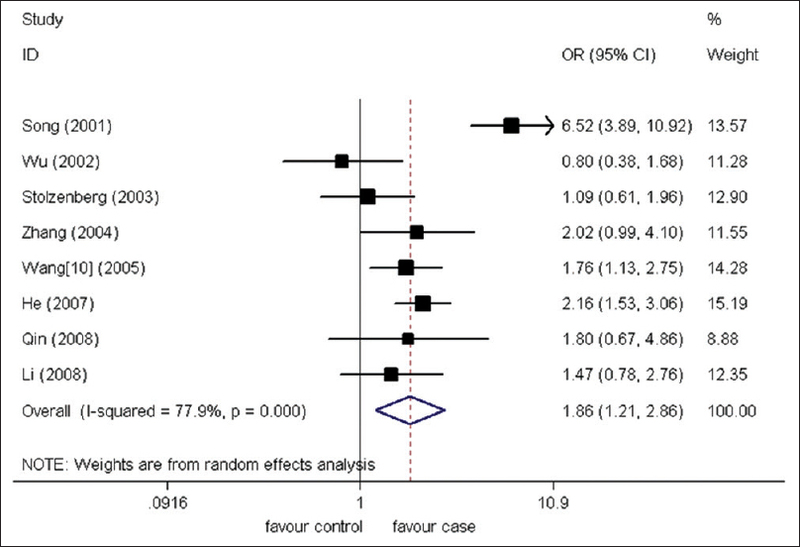 According to our further full-text screening, 6 clinical trials were included in the final meta-analysis. Results: Six papers were included in this study. The progression-free survival (PFS), overall survival (OS), objective response rate (ORR), and toxicity were included in our outcomes. The pooled hazard ratio (HR) of PFS was 1.57 (95% confidential index [CI] = 1.47–1.69). The pooled HR of OS was 1.66 (95% CI = 1.43–1.92). The pooled risk ratio of ORR was 0.56 (95% CI = 0.35–0.91). The toxicity analysis showed odds ratio = 1.79 (95% CI = 1.20–2.69). Conclusions: In terms of PFS, OS, and toxicity the effect of erlotinib in the treatment of advanced NSCLC patients is superior to docetaxel. Objective: To investigate the feasibility of inducing adipose-derived stem cells (ADSCs) to nucleus pulposus cells (NPCs). Materials and Methods: ADSCs were isolated from rabbit while NPCs were isolated from an allogeneic rabbit. NPCs were co-cultured with the 3rd generation ADSCs in co-cultured system. Only NPCs were cultured in single culturing group. Through the collagen type II collagen immunohistochemistry, we observed NPCs and then identify NPC. Proteoglycan messenger RNA (mRNA) and collagen type II mRNA level were measured by real-time polymerase chain reaction. 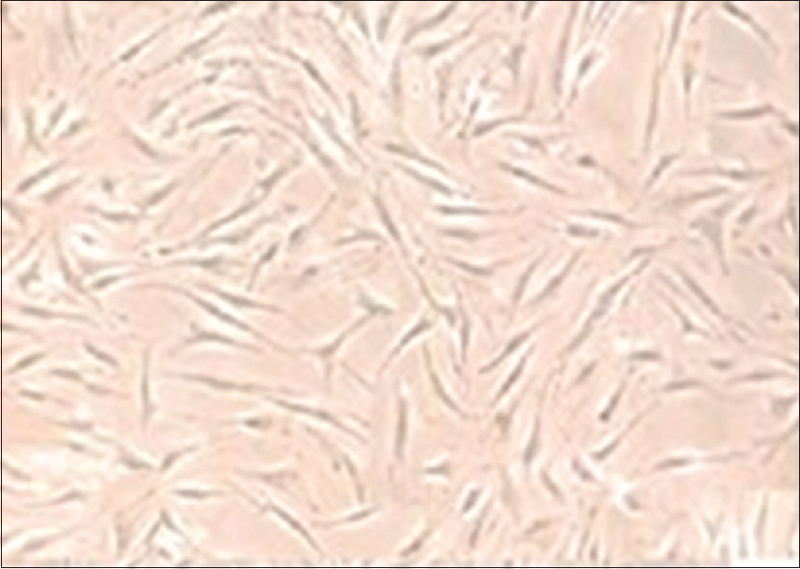 Results: In two group cells, collagen type II collagen were detected by immunohistochemistry. The amount of proteoglycan mRNA and collagen type II mRNA was both significantly higher in co-cultured group than in single cultured group. Conclusions: In some condition, ADSCs have the potency to differentiate toward nucleus pulposus-like cells. ADSCs are better seed cells for tissue engineering of artificial nucleus pulposus. Objective: The purpose of this study was to evaluate the clinical efficacy of super-selective intracranial artery infusion chemotherapy and to determine correlated prognostic parameters for advanced lung cancer patients with brain metastases. Patients and Methods: Fifty-four lung cancer patients with brain metastasis who had no previous treatment were enrolled for the study. These patients received super-selective intracranial artery infusion chemotherapy, as well as arterial infusion chemotherapy for primary and metastatic lesions. The procedure was performed once every 4 weeks. Patients were monitored to evaluate short-term clinical outcomes 4 weeks after the first 2 treatments, and follow-up visits performed every 4 weeks after the first 4 treatments until the appearance of disease progression or intolerable toxicity. Results: All 54 cases were treated at least 4 times. The overall response rate was 55.56% (30/54), and the disease control rate was 85.19% (46/54). The median overall survival was 7 months, with a 95% confidence interval (CI) of 5.87–8.13 months, and the median progression-free survival was 4 months, with a 95% CI of 3.20–4.80 months. 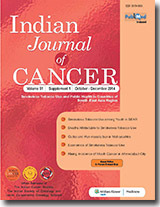 The 6-month survival rate and 1-year survival rate were 81.48% (44/54) and 18.52% (10/54), respectively. Conclusion: Super-selective intracranial artery infusion chemotherapy provides a clinically efficacious avenue of treatment for lung cancer patients with brain metastases. Pathological classification, Karnofsky performance status, and extracranial metastases may serve as reliable prognostic parameters in determining the clinical outcomes for lung cancer patients with brain metastases. 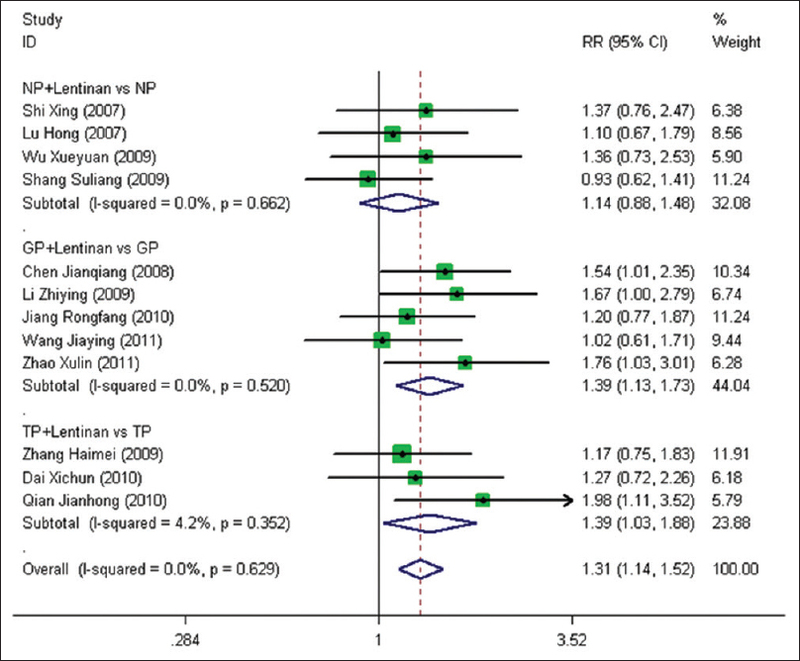 Objective: The aim of this meta-analysis was to assess the methylene tetrahydrofolate reductase (MTHFR) gene C677T polymorphisms and esophageal cancer susceptibility in Chinese Han population. Materials and Methods: The databases of PubMed, MEDLINE, Wanfang, and CNIK was electronic searched to find the case–control or cohort study about the relationship between MTHFR gene C677T polymorphisms and esophageal cancer susceptibility in Chinese Han population. The odds ratio (OR) was used to assess the relationship between CC, CT, and TT genotype and esophageal cancer risk. The data were pooled using Stata 11.0 software. Results: Eight articles included 1752 esophageal cancer and 2363 controls were found and included in this meta-analysis. The pooled OR was 1.86 with its 95% confidence interval of 1.21–2.86 and 1.62 with its 95% confidence interval of 1.15–2.27 for TT versus CC and CT versus CC model which indicated that people with TT OR CT genotype significant increase the risk of developing esophageal cancer. Conclusion: Esophageal cancer risk was significantly increased in people with TT/CT genotype of MTHFR gene. Objective: To systematic review and analysis the clinical efficacy and toxicity of lentinan injection combined with chemotherapy in the treatment of nonsmall cell lung cancer (NSCLC). Materials and Methods: The databases of PubMed and CNKI were electronic searched with the free text word of lung cancer/NSCLC and lentinan. The prospective clinical study reporting the clinical efficacy and safety of lentinan injection combined with chemotherapy in the treatment of NSCLC were reviewed and included in this meta-analysis. The combined treatment efficacy and toxicity of lentinan injection combined with chemotherapy were pooled by Stata 11.0 software. Results: Twelve clinical studies of lentinan injection combined with chemotherapy in the treatment of NSCLC with 458 controls and 492 NSCLCs patients were finally included in this meta-analysis. The pooled results indicated that the objective response rate was significant improved in the lentinan injection combined chemotherapy group compared with chemotherapy group only (relative risk [RR] = 1.31, 95% confidence interval [CI]: 1.14–1.52). The chemotherapy-related toxicity of III/IV gastrointestinal reaction (RR = 0.54, 95% CI: 0.43–0.68) and III/IV granulocytopenia (RR = 0.65, 95% CI: 0.51–0.70) were significant decreased in the combined group. Conclusion: Lentinan injection combined chemotherapy significant increase the objective response rate and decreased the chemotherapy-related toxicity. Background: There is not more treatment selection for advanced nonsmall-cell lung cancer (NSCLC) patients who had disease progression after two previous treatments. Everolimus is an oral inhibitor of the mammalian target of rapamycin pathway, which is aberrantly activated in NSCLC. Patients and Methods: Stage IV NSCLC patients, with one or multiple prior chemotherapy regimens, received everolimus 5–10 mg/day with or without chemotherapy until progression or unacceptable toxicity. The primary objective were toxicity of everolimus and overall disease control rate (DCR). Results: 22 patients were enrolled. Common ≥grade3 events were stomatitis, dyspnea, vomiting, thrombocytopenia. Overall disease control rate was 54.5% among 22 patients, 1 had a partial response, and 11 had disease stabilization. Common ≥Grade 3 events were stomatitis, dyspnea, vomiting, and thrombocytopenia. Conclusion: Everolimus was well tolerated, showing the modest clinical activity in heavily pretreated advanced NSCLC. The incidence of synchronous lung tumors is rare, as reported in various clinical series, ranging from 0.2% to 8%. Most reported cases of synchronous tumors were shown to have the same histologic types of lung cancer. Among possible combinations, squamous cell carcinoma was by far the most common. Primary pulmonary lymphoma (PPL) is very rare in clinics accounting for only 0.5–1% of primary lung tumors. There is no report about synchronous primary pulmonary adenocarcinoma presenting with lung lymphoma. It can be easily misdiagnosed or missed. Although the treatment of PPL and synchronous pulmonary tumors has controversial, surgery with/without postoperative adjuvant radio-chemotherapy are used for most patients in present. We describe a case of synchronous primary lung tumors presenting with lymphoma and adenocarcinoma, in which expression of the cell surface antigens were evaluated immunohistochemically. By taking into consideration of the reported experiences, the author discusses the clinical features, prognostic criteria and therapeutic management of synchronous lung cancer and PPL.